The age of boring default basic form buttons is long gone. CSS3 buttons of the future drop shadows, are colored in gradients and have rounded corners to please the eyes of the aesthetically spoiled Internet users. The web has been made into a competitive playground for creative and idea-filled web designers, making those who do not embrace the future fall behind in the race for site visitor attention. 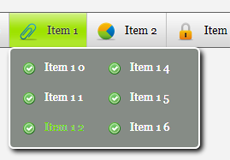 If anything, the onset of CSS3 has made building cool-looking buttons easier, but it had not been impossible. Unlike the partly pessimistic assessment that those who miss out on the greatness of CSS3 buttons will inevitably lose in the fight for Internet traffic, this actually means that it had made it easier for conventional website owners to produce sleek and professional-looking elements of design and style, making their efforts at site building much more competitive. This is good news for everyone, except maybe a top percent of active genius web designers, whose rates for quality website designs will drop in the face of a growing supply of substitute CSS3 creations. Even for them, it puts lost of extra strain off their shoulders and opens up new possibilities before them. Among the many effects themselves, there are smooth rounded corners, advanced lighting settings, application of various shine effects, freedom with shadows, complex gradient color mixes and many others, perhaps not as worthy of special mention, but widely available and at everyone’s disposal nevertheless. Navigation menus can benefit from all of the above features, capturing the site visitors on a subconscious level before they even notice the site’s content itself. A site that uses friendly CSS3 gradient buttons in its navigation bar will win over more regular visitors from its random hits than one that insists on using old-fashioned buttons. As the use of CSS3 buttons will clearly benefit any website and visitor, the only reason that could discourage webmasters from applying it in their work could be the challenging process of learning CSS3 techniques or finding the right templates. 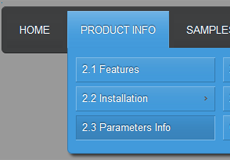 Users who are looking to enhance their website’s navigation menu with all the cutting-edge features will be pleasantly surprised by the availability of such CSS3 button generator applications as CSS3 Menu, eliminating the need for purchasing costly professional software or reading through time-consuming tutorials. I would like to use my macbook pro to learn and create the menu then transfer to finished menu to the windows 7 PC, is this possible or do I need to create two menus, 1 for windows PC and 1 for the mac? I have a horizontal menu (flat template) and would like the drop down submenus on the far right hand side to open to the left rather than the right so they don't go outside the centered content for the page. Is this possible?